Inspired by a Discovery Days talk by the Centre for Research into Cancer Prevention and Screening earlier this month, Finance Director Carol Prokopyszyn decided to challenge herself and her colleagues to be more active during their working day. 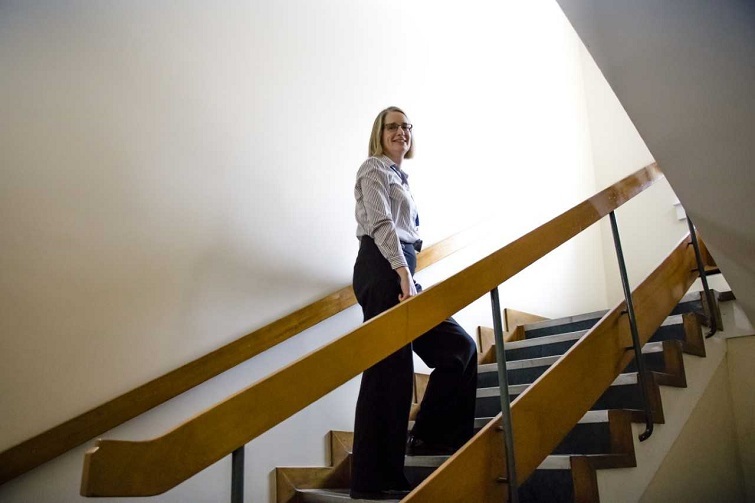 Believing that a small change could make a big difference, she began taking the stairs instead of the lift, logging 64 flights of stairs in her first week. Now other members of her team have joined in, as have staff in other departments across the University and Carol is hoping more people will think about taking steps to improve their health. “I was listening to the talk at Discovery Days where the winners of the Stephen Fry Award for Public Engagement said that 45% of cancers are preventable and it really made me think about what I could do to reduce the risk. “Stairs were an obvious choice as I work in the Tower building so I decided to stop using the lift and use the stairs instead and I challenged the rest of the team to join me. In the first week I had walked up 64 floors and that was done just by going about my usual day to meetings and out to lunch. And she is hoping more people throughout the University will be inspired to take on the Challenge and become more active. Carol, perhaps unsurprisingly as an accountant, is logging her step climbing on an excel spreadsheet complete with graphs and targets so she has a visual reminder in the office.